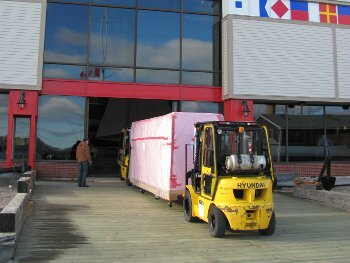 It was years in the making, but on November 29, 2010 a magnificent 18′ builder’s model of the renowned former Cunard flagship Lusitania arrived in Halifax, Nova Scotia where it will become the centre-piece of a revamped ‘Cunard exhibit’ at the Maritime Museum of the Atlantic. 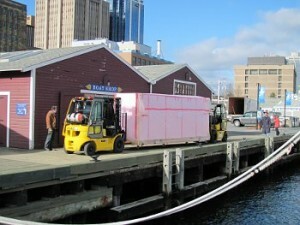 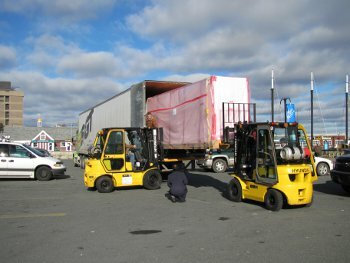 It was trucked from Toronto, Ontario where since the mid 1960’s it has been in storage in the Marine branch of the City of Toronto Museum. 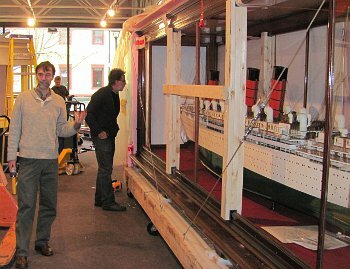 The model was painted white and reconfigured as a sister ship Mauretania after the tragic torpedoing and sinking of Lusitania May 7, 1915.
past CSS Acadia, and on into her new home in the Maritime Museum of the Atlantic. shown here with Dan Conlin, curator of marine history in foreground and Eamonn Doorly, master boat builder in background.